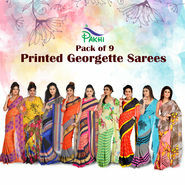 Featuring vibrant colours and latest prints, this Pack of 9 Assorted Printed Georgette Sarees by Pakhi (9G11) is a perfect fusion of style and comfort. 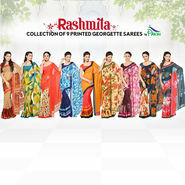 Made from georgette, the sarees are lightweight, thus easy to drape and carry. 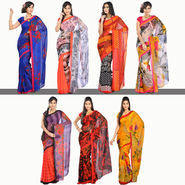 Floral, Geometric & Abstract design further enhances the look of the sarees. 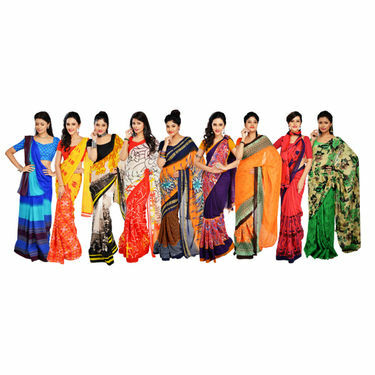 Each saree comes with matching blouse pieces and is ideal for office, parties, outings or evening wear. They are great for gifting too. 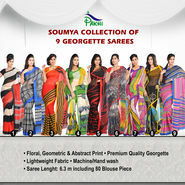 Note: *You will get any 9 sarees from the thousands of wonderful designs. 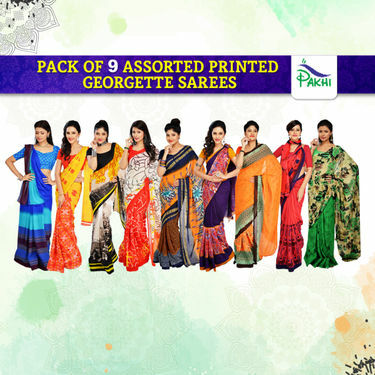 Versatile & charming, Pack of 9 Assorted Printed Georgette Sarees by Pakhi (9G11) is a perfect pick that will suit your taste and style. The traditional colors and running prints in the combo is a must-have addition to your existing saree collection. Designs/Prints: The collection is an ode to Floral, Geometric & Abstract prints that look ravishing overall. The colours are rich and vibrant, thus are suitable for all types of skin tones. 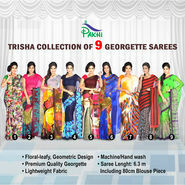 If you are looking for fashionable and trendy sarees, then opting Pack of 9 Assorted Printed Georgette Sarees by Pakhi (9G11) is best to go. 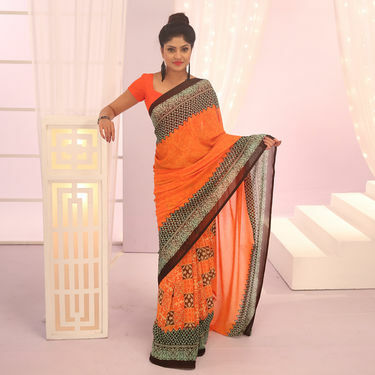 The combo is affordable and saves your money on buying separate sarees for different occasions.